218 in stock Need More ? 20 cm xiii, 497 p.
Reprint. Originally published: Garden City, N.Y.: Doubleday; London: New English, 1977. 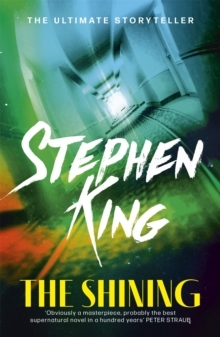 One of the true classics of horror fiction, THE SHINING is regarded as one of Stephen King's masterpieces. Danny is only five years old, but in the words of old Mr Hallorann he is a 'shiner', aglow with psychic voltage. When his father becomes caretaker of the Overlook Hotel, Danny's visions grow out of control. As winter closes in and blizzards cut them off, the hotel seems to develop a life of its own. It is meant to be empty. So who is the lady in Room 217 and who are the masked guests going up and down in the elevator? And why do the hedges shaped like animals seem so alive?Somewhere, somehow, there is an evil force in the hotel - and that, too, is beginning to shine . . .